Corn (maize) has been the principal food of the Tarahumara Indians since long before the Spanish arrived in Mexico. There are several precolumbian varieties that are still grown, including the ancient and delicious “blue corn”. Maize is the source of a wide variety of foodstuffs and drinks including flour (pinole), a non‑alcoholic drink called esquiate, tortillas, atole and tamales. Green corn and blue corn tortillas are made when in season, for special occasions. A version of corn beer (Spanish “tesgüino“) is also important, and is described separately below. The Tarahumara continue to “hunt and gather” locally available foodstuffs, though these activities now supply only about 10% of their diet. Several varieties of cactus fruit are collected, edible agaves are cooked, and small river fish are caught where possible. Small animals are ruthlessly hunted. Squirrels, birds and deer, though rare today, are considered particular delicacies. Beans, mustard green and squash also play important parts in the Tarahumara diet which is rounded out by wheat, potatoes, peaches and sweet potatoes. Those Tarahumara with access to lower elevations, such as Batopilas Canyon, also include crops typical of warmer regions such as oranges, figs and sugar‑cane. Chiles and tobacco are also cultivated. Meat is hard to come by, and eaten only on ceremonial occasions when a goat or cow is sacrificed. It probably accounts for less than 5% of the average Tarahumara diet. Most protein comes from beans; these are usually prepared by roasting, grinding and then boiling with water, to produce a hot soup. Pork, chicken and eggs are rarely found, while sheep are kept mainly for their wool. Squash is only eaten in season though the Indians know how to preserve it by drying. The squash flowers are eaten too, boiled with water and salt. Mustard greens (Tarahumara “maquasori“, Spanish “quelites“) are grown in the rainy season and carefully gathered and dried, for use throughout the year, providing minerals and vitamins. Quelites include the epazote plant (Chenopodium ambrosioides), described by Diana Kennedy, the world’s foremost authority on Mexican cuisine, as “the Mexican herb par excellence”. Many families have a small number of scrubby fruit trees, usually peaches, near their house. Fruit is often picked and eaten green. Peaches are an important trading item, and may be exchanged for cigarettes or cloth. At higher elevations, apples are grown. Given the well-documented endurance feats of Tarahumara runners, this diet clearly provides adequate nutrition! In the 1994 Denver, Colorado, “Sky Race”, Tarahumara Indian Juan Herrera (25 years old) smashed 25 minutes off the previous record, completing the 160 kilometers in 17 hours, 30 minutes, 42 seconds. He came in more than half an hour ahead of his nearest rival! However, in many years (including 2011, 2012), and seemingly with increasing frequency, food is in extremely short supply by the time the summer growing season arrives. Fortunately for the less successful Tarahumara farmers, an age‑old tribal custom, korima is still observed. This custom requires the better‑off to share food with the less fortunate in times of need. The poor person visits successive ranchos, collecting small quantities of food to last him a week or two, then repeats this procedure as necessary. No lasting debt is incurred. The severe drought in northern Mexico over the past 24 months – see Many states in Mexico badly affected by drought – has meant that many Tarahumara have no food reserves left and have had to rely on infrequent emergency aid organized by charitable organizations, and the federal and state government. The average Tarahumara family expends 100 kg of corn a year to make tesgüino. This is sufficient corn to last a family of 4‑5 about a month, a significant quantity, given the regular annual food deficiencies in this region. Tesgüino is a form of corn‑beer. It is a thick, milky, nutritious drink, supplying much needed vitamins, minerals and calories. The corn is first dampened and allowed to sprout in a dark place, then ground and boiled for about 8 hours with a catalyst to promote fermentation. The catalyst may be local grass seed (basiahuari) ground in a metate, or bark, leaves, lichens or roots, depending on the place. The liquid is then strained and left to ferment for about three days. The total preparation time is therefore about seven days. To avoid spoilage, the beverage must be drunk quickly. It’s at its best for only 12‑24 hours. This explains why it would be so wasteful to leave any beer can tesgüino undrunk at a “tesgüinada” (see below); it would be far too wasteful, even if as many as 50 gallons have been made. Other alcoholic drinks are also made, one based on green corn (pachiki or caña) and another on maguey (meki). In earlier times, there were no alcoholics as we define the term, since tesgüino can’t be stored, but today the greater availability of commercial alcohol poses a serious problem. Why are tesgüinadas so important? The tesgüinada system is the social device which ties individual settlements (ranchos) together in a cooperative framework for performing all kinds of agricultural tasks. The person requiring assistance with a particular task will invite his neighbors and friends to a “tesgüinada”. He takes responsibility for providing the tesgüino, other refreshments and food. In return, the persons who attend will help plow. sow, reap or weed.. The tesgüinada is necessary since many families cannot supply the labor required for both herding and cultivation at certain times of the year. In small groups like the ranchos, high mortality inevitably leaves some families unable to manage on their own. The tesgüinada is their response to the economic uncertainties facing them just as collective religious rituals help them face the unpredictability of weather, sickness and plagues. The cooperative effort moves from one rancho to another, from one tesgüinada to the next. The tesgüinadas, which are like large, boisterous parties, provide a focus for Tarahumara social life, a chance for entertainment and to make extra-familiar friendships. Being held in a succession of different ranchos, they offer some communal resilience against the risks of becoming further isolated and marginalized. The Tarahumara attach no shame to being drunk; indeed, they positively revel in getting as drunk as humanly possible at tesgüinadas. Children are excluded until they are 14 years old or so. Tesgüinadas do come at a cost. They increase the incidence of accidents, such as adult men falling off precipitous rock ledges that would normally pose little risk, even when running. They increase violence, which may result in serious injury or death. They also limit the amount of corn that can be held over from one year to the next. Assuming an average of 4‑6 tesgüinadas per year per family, with additional visits to tesgüinadas held in perhaps 15 other households, many Tarahumara Indians would be likely to attend more than sixty tesgüinadas a year. Even if the true figure is only 50% of this total, it still means that the Tarahumara spend as many as 100 days a year either preparing for a tesgüinada, attending one, or recovering from one. Honey, what’s on that label? 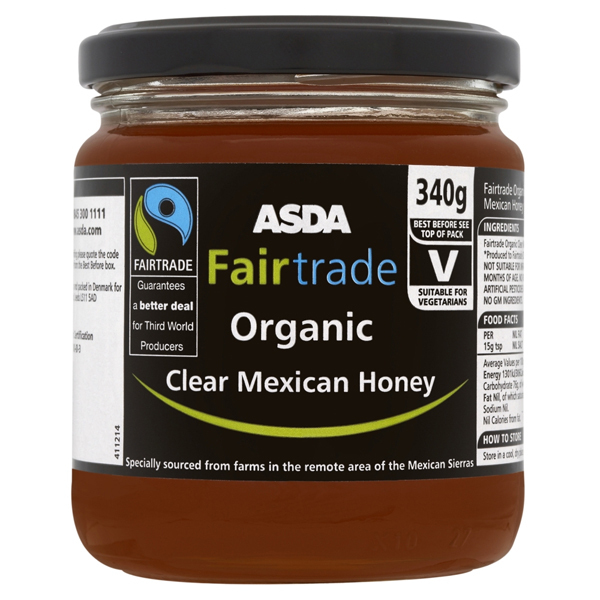 While updating our posts on honey recently, we took a look at which brands of Mexican honey sell overseas and how these brands are labeled. Let’s take a closer look at two of them. 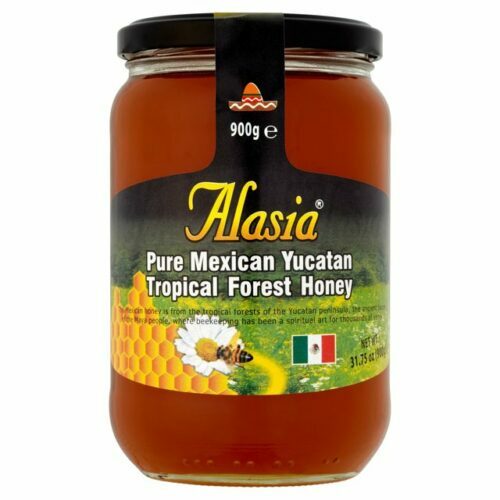 First up is Alasia Honey, labeled as “Pure Mexican Yucatan Tropical Forest Honey”. The smaller print says that “This Mexican honey is from the tropical forests of the Yucatan peninsula, the ancient heart of the Maya people, where beekeeping has been a spiritual art for thousands of years.” Great description, and sounds pretty accurate in all respects. Native Mexican honeybees were, and are, important to the Maya people, and the natural vegetation of most of the Yucatan Peninsula is, indeed, tropical evergreen forest. Anytime the “Fairtrade” name is used, most people assume that it is likely to be more respectful to the producers, and probably also assume that any further description will be culturally sensitive and geographically accurate. This is only partly true for the Asda honey. Below the Fairtrade symbol, it says “Guarantees a better deal for Third World Producers.” The term “Third World” slipped out of fashion (for good reason) a long time ago, so hardly counts as contemporary development terminology. The small print along the bottom of the label says, “Specially sourced from farms in the remote areas of the Mexican Sierras”. Hmm… really?? There are several areas of high relief in Mexico that are named “Sierra” (“Mountain Range”), the two major ones being the Western Sierra Madre and the Eastern Sierra Madre, both well to the north of Mexico’s main honey-producing states. Most organic honey in Mexico comes from the Yucatán Peninsula, where there are no Sierras. Hence, the claim that this honey originates in “remote areas of the Mexican Sierras” is, at best, geographically ambiguous, and at worst, geographically inaccurate. We don’t know which honey tastes better, but we do know which has the more honest and culturally-sensitive labeling! Mexico’s seven leading food and beverage multinationals have invested a total of 7.42 billion dollars overseas in the past five years. The investments include acquisitions of other firms, building new plants and enlarging or remodeling existing plants. In terms of the number of countries where they have a presence, the two most globalized food and beverage firms in Mexico are Grupo Bimbo and Gruma, which are in 22 and 18 countries respectively (see map). Both firms are now quite dependent on foreign earnings. About 61% of Bimbo’s revenues, and almost 70% of Gruma’s revenues, originate from outside Mexico. Both firms have the longest reach of any of the food and beverage multinationals: Bimbo as far as China, and Gruma in Australia. Femsa, based in Monterrey, is the world’s largest bottler of Coca-Cola products, with 45 plants in Latin America, including Colombia, Brazil and Venezuela, as well as 19 plants in the Philippines. It spent 1.855 billion dollars to buy Brazilian firm Spaipa, and a further 258 million dollars on building a new plant there (its tenth plant in Brazil), as well as 688.5 million dollars for 51% of the Coca-Cola Company in the Philippines. Femas also operates the OXXO chain of convenience stores, the largest such chain in Latin America. Grupo Bimbo is the world’s largest bread maker and the biggest bread seller in the USA. It is the world’s 4th largest food company behind only Nestle, Kraft, and Unilever. Bimbo has 85 plants in the USA and Canada, 39 in Mexico, 32 elsewhere in Latin America, 10 in Europa and one in Asia. It has expanded primarily via acquisitions. It bought Canada Bread in 2014 for 1.66 billion dollars. In 2011, U.S. agencies authorized its purchase of Sara Lee for 709 million dollars. It also bought Bimbo Iberia (Spain) for 160 million dollars in 2011. It is now awaiting approval from Spanish regulatory authorities to complete its purchase of Panrico for 210 million dollars. Gruma (main brands Maseca and Mission) is the world’s largest producer of corn flour and tortillas. It has 79 production plants worldwide and operates in North America, Europe, Asia and Oceanía. Gruma recently bought Azteca Foods Europe (Spain) for 48 million dollars. In 2014, it bought Mexifoods (Spain) for 15 million dollars. It also owns Albuquerque Tortilla Company. Gruma has also invested in new factories, including a 50-million-dollar plant in California, opened in 2010, as well as a new factory in Russia costing a similar amount. Arca Continental, the second largest Coca-Cola bottler in Latin America, has 35 plants in the region. It purchased a milk products firm, Holding Tonicorp (Ecuador), in 2014 for 400 million dollars, and spent around 330 million dollars in 2012 to acquire two snack food firms: Wise Foods (USA) and Inalecsa (Ecuador). Sigma Alimentos (cold cuts, cheese, yoghurts and other milk products) has 67 production facilities in total, including (in addition to Mexico) the U.S., Costa Rica, El Salvador, Spain, France, Italy, Netherlands, Belgium and Portugal. It recently bought Spanish firm Campofrío for 345 million dollars. Grupo Lala (milk products) has 18 production plants in Mexico and Central America. It recently bought Nicaraguan firm Eskimo (ice-cream and other milk products) for around 53.2 million dollars. Grupo Herdez has 13 plants in Mexico, one in the USA and one in Chile. It recently bought Helados Nestlé in Mexico. What these firms have in common is that they specialize in making products that are relatively easy to adapt to local tastes (glocalization). They have also started their expansions outside Mexico by focusing initially on markets with familiar languages and culture before venturing further afield. As interesting as where the companies ARE is where the companies are NOT. Astonishingly, the map suggests that no Mexican food-related multinational yet has a toe-hold in any country in Africa, for example. Diana Kennedy is the world’s foremost authority on regional Mexican cuisines. Born in the UK, she moved to Mexico in 1957 with her husband, Paul Kennedy, a New York Times correspondent. Over the next half a century, Kennedy traveled the length and breadth of Mexico, collecting stories, cooking techniques and recipes, and writing about regional cuisines from all over the country. Now in her nineties, Kennedy continues to live in an eco-friendly house in s small village near the city of Zitácuaro in the western Mexico state of Michoacán. The Mexican government awarded her the Aztec Eagle, Mexico’s highest award for non-Mexicans, for her truly outstanding contribution to the country. In this recent BBC radio podcast, Diana Kennedy is interviewed about her lifetime’s work, including the thousands of hours spent driving along dusty dirt tracks in her pick up truck in search of yet another unrecorded gem of Mexican cuisine. Her travels often took her to indigenous villages, way off the beaten track, where she would study how and what the local people cooked, discovering along the way, all kinds of things never previously written about. The initial leads for the next trip often came from the maids of friends in Mexico City, maids who were prepared to share their family recipe secrets with her. Kennedy documented varieties of corn and beans that are rapidly disappearing, as are the small family farms where they were grown. In most locations, she would start by exploring the local market. Marveling over the incredible fresh produce she encountered wherever she traveled, she recorded every detail; sadly, some of these markets have long since disappeared. The “Mexican miracle” of the 1960s and 1970s, with its growing economic prosperity brought a tide of imported foods into Mexico. These reached deep into the countryside. In many places, traditional foods were forgotten, replaced by imported items such as wheat bread and pork chops. Dietary changes have continued to plague Mexico, leading to a dramatic increase in obesity. Note, though, that despite the claims made on this BBC program, Mexico does not yet lead the world in obesity – though it is the fourth most obese country in the world (excluding small island states). Clearly, BBC researchers should read Geo-Mexico more often. 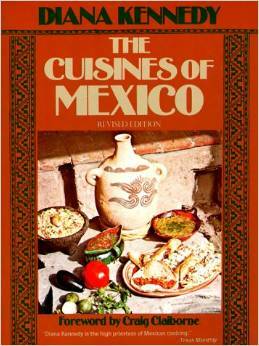 Kennedy’s 1972 book, The Cuisines of Mexico was a ground-breaking look at the regional world of food in Mexico. UNAM, Mexico’s National University, is keeping Kennedy’s work alive by making digital copies of all her notebooks, some of which date back to the 1950s. For more about Mexican cuisine, visit the amazing award-winning blog Mexico Cooks! and also browse the huge selection of recipes, articles and tips about all aspects of Mexican food and cooking in the “Cuisine” section of MexConnect. ¡Buen provecho! A taco is a corn or wheat tortilla folded or rolled around other edible ingredients, and designed to be eaten by hand – the indigenous Mexican equivalent of a sandwich. Tacos are extremely versatile and often accompanied by garnishes such as tomatoes, onions, lettuce, radishes, and avocado or guacamole, topped with salsa and cilantro. Who would have thought that the humble taco was worth its own encyclopaedia? 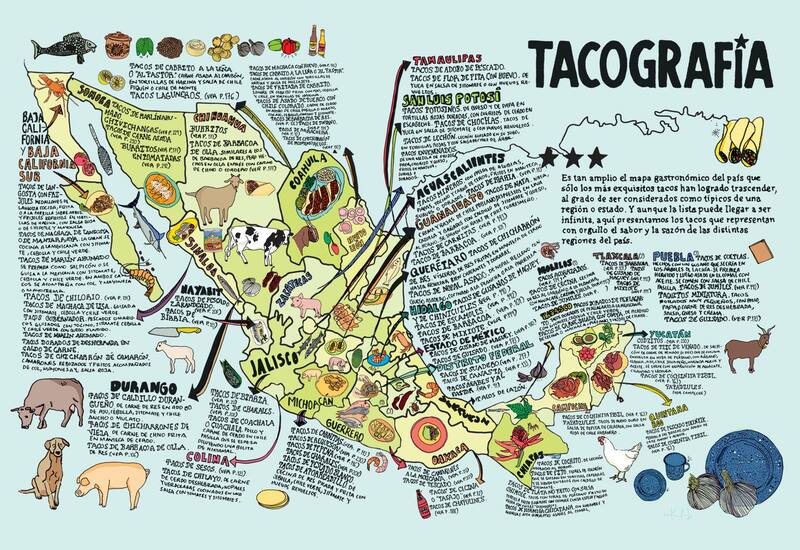 This particular encyclopaedia includes a fascinating graphic – a map (see graphic) summarizing the different regional varieties of taco commonly found in different parts of the country. Regional varieties of Mexican tacos. Credit: La tacopedia. Enciclopedia del taco (Spanish Edition) . Click to enlarge. The map is by no means an exhaustive list, but does include examples of taco specialties for every state. Feeling daring? Try the tacos envenenados in Zacatecas. The literal meaning is “poisoned tacos”, but they are apparently named so as not to reveal all their ingredients! Tacos have become incredibly popular. While they predate the Spanish conquest, they are now well on their way to conquering large swathes of North America and Europe. For more about tacos, we recommend reading La tacopedia. Enciclopedia del taco by Deborah Holtz and Juan Carlos Mena (Trilce Ediciones, 2012). In an earlier post, The geography of banana production in Mexico, we provided an overview of banana production in Mexico. 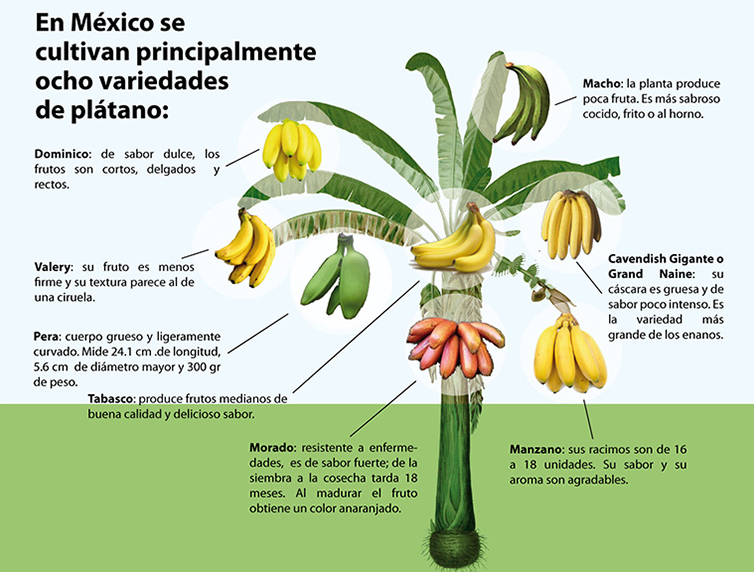 Eight different kinds of bananas are grown in Mexico (see graphic). The harvesting of bananas is mainly in the third quarter of each year. Researchers have developed “environmentally friendly tortillas” that are more nutritious, help prevent osteoporosis, slow the aging process and help fight obesity. A team led by Juan de Dios Figueroa Cárdenas, of Cinvestav’s unit in Queretaro, developed an environmentally-friendly method to turn gourmet corn into tortillas that have a high nutritional content and double the shelf life, without increasing the price of the final product. The current process used to make tortillas is “highly polluting” and “not very efficient,” resulting in tortillas that “in many cases do not contain the fiber or calcium” people need. Given the importance of tortillas in the Mexican diet since pre-Columbian times, researchers worked on developing a process that “does not produce pollutants” and replaces lime, a corrosive substance, with salts and other ingredients in the cooking process. The use of other salts retains the outer layers of corn kernels during cooking and preserves a large amount of nutrients that end up being lost in the existing process and generating an enormous amount of pollution and wasted water. The tortillas are also useful in fighting obesity (a huge problem in Mexico) because they contain double the fiber of a traditional tortilla, Figueroa Cárdenas said, adding that the tortillas’ high calcium content will help prevent osteoporosis. Are you interested in the geography of Mexico’s regional cuisines or the historical relationships between food preparation methods and gender roles in Mexican society? If so, add ¡Que vivan los tamales! Food and the making of Mexican Identity by Jeffrey Pilcher to your “Books Wanted” list. Pilcher’s lively and entertaining account analyzes how the history of food in Mexico has been intimately tied to the country’s evolving national identity. The connections have become widely recognized, so much so that UNESCO recently conferred Intangible Cultural Heritage status on traditional Mexican cuisine, especially that of the state of Michoacán. In every chapter, Pilcher delves into the details. He explains how Mexico’s elites strongly preferred dishes based on wheat (first introduced into Mexico by early colonists) to those based on corn, one of Mexico’s many contributions to world cuisine. Indeed, they went so far as to argue that, across the globe, societies based on corn or rice would never rise above those based on wheat. True appreciation of Mexico’s indigenous foods developed only slowly, mirroring the gradual development of nationalism, before coming to be considered a key component of the national identity. The advent of the railways in the 19th century allowed exotic foodstuffs to be marketed throughout the country for the first time. National cookbooks began to appear, highlighting the distinctive dishes of different regions, a trend continued to the present-day. Technological developments have brought many changes. 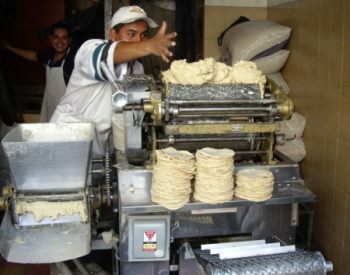 With industrialization, the time-consuming preparation of traditional corn tortillas was gradually superseded, especially in urban environments, by machine-made tortillas, whose taste is considered by connoisseurs to be greatly inferior to that of their hand-made equivalents, now increasingly restricted to relatively remote rural areas. Each step in the industrialization of tortillas brought massive social changes. Traditionally, the production of tortillas was the preserve of womenfolk, one of their numerous daily household chores. When mechanized tortilla presses were introduced, the making of tortillas quickly became an acceptable occupation for men. Freedom from the arduous work involved in making tortillas daily from scratch allowed women time to pursue other activities and to enter the formal workforce. Gender, race, social class, dietary preferences, the fusion of indigenous cuisine and techniques with ingredients and methods imported from Europe and elsewhere… all are explored in this fascinating book. Mexico’s cuisine is justly famous for its extraordinary regional variety; in just a few decades, the essential ingredients for Mexican food have become global commodities, appearing on supermarket shelves in dozens of countries around the world. Pilcher’s book puts this success in context, making it an essential read for anyone interested in the geography and history of Mexican cuisine. 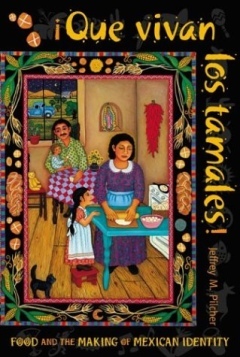 Details (link is to amazon.com): ¡Que vivan los tamales! Food and the making of Mexican Identity by Jeffrey M. Pilcher (University of New Mexico Press, 1998). For more about Mexican cuisine, visit the amazing award-winning blog Mexico Cooks! and also browse the huge selection of recipes, articles and tips about all aspects of Mexcan food and cooking in the “Cuisine” section of MexConnect. ¡Buen provecho!